We had no idea that healthy could taste so good. 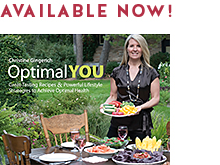 Optimal YOU provides practical and valuable advice about foods, health and overall well-being. It is well written, touching and deeply insightful, with outstanding recipes for everyone. Optimal YOU will NEVER share or sell your personal information. NOTE: Before chosing a quantity, fill out your address above to allow proper shipping calculations. Quantity Please Choose a Quantity 1 2 3 4 5 6 7 8 9 10 @ $32.99 CDN ea.